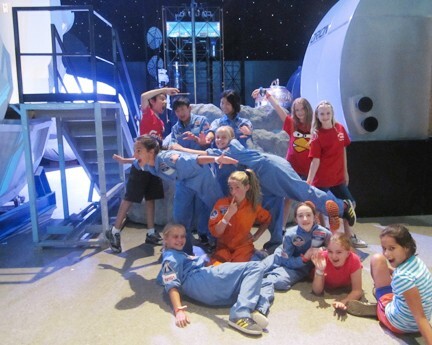 GSCSNJ Blog Space: Cranbury Troop 71904 Goes to Space Camp! Cranbury Troop 71904 Goes to Space Camp! At the end of June 2012, my Girl Scout Troop took a plane down to Huntsville, Alabama for the adventure of a lifetime! For the past three years, our troop has been saving up money by selling thousands of cookie boxes and holding other fundraisers, for just this one special week... We were going to Space Camp! This Camp is known globally and has been featured in movies such as "Space Camp" and "A Smile as Big as the Moon." Space Camp was the idea of the late Dr. Wernher von Braun, former director of NASA’s Marshall Space Flight Center and the chief architect of the Saturn V Rocket – the super booster that propelled Americans to the moon. This summer, the camp celebrated its 30-Year Anniversary and has had almost 600,000 trainees graduate, with four of them becoming astronauts for NASA. At Space Camp, we were known as Team Boyd. Our team consisted of our troop's ten girls, plus two campers whom we never met: a boy from Taiwan and a boy from Washington. At the camp, we learned countless things about space history, rockets, astronauts and so much more! The camp also taught us survival skills and military-based ideas. 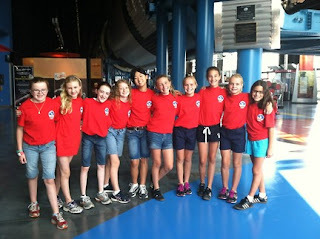 We had chosen to be a "hybrid" group, and as a result we experienced both Space Camp and the Aviation Challenge. That week we had the chance to meet Dr. Don Thomas, an astronaut who participated in four Columbia and Discovery missions. He reminded us "to do your very best in every aspect of your life because you never know what skill you'll acquire that will help you reach future goals." We were lucky enough to try out simulators that simulated weightlessness, a helicopter crash and rescue, the flying of fighter jets, and frictionless environments. The favorite simulator among the group was the Multi-Axis Trainer (MAT) otherwise known as the Three-Ring Chair. This chair simulates what a tumble spin would feel like when returning to earth's atmosphere. Then, there was our mission. This was supposed to show us how an actual rocket launch and return would work. Everyone was assigned a job such as flight director, commander, pilot, mission specialist, mission scientist, INCO, CATO, and many other jobs. Everyone managed to arrive at their destination, whether it was mission control, the orbiter, or the space station in addition to completing the scripted mission. Lastly, we graduated at the US Space and Rocket Center right under the breathtaking display of the actual Saturn V test rocket – the building was specially designed for this rocket's display. During graduation, our team received the Outstanding Team Award! We believe we were awarded this honor because we worked well together and listened to our peers as well as our leaders. One other award received at graduation was a "King of the Hill" award. King of the Hill was a competition where all the peer teams competed in air-to-air combat in the fighter jet simulators. The award was presented to our very own Sarah Pagano for being the last pilot flying! As a result of this experience, we have grown as a team and a troop. We learned so much about each other, we communicated well, and we felt confident that someone would always have our back. We have also grown as individuals and learned so much more about ourselves. We all agree that before Space Camp, we didn't realize we could go for a long time without family. We can do anything if we put our minds to it! We now can move forward in life knowing that even when the going gets tough we can work through it and come out on top!